If you ever wanting to enjoy the autumn season, then you must go to Russia during the period of September to late October. Why is the autumn so short in Russia? Well, it’s because of the location Russia is situated. Because of that, the longest season in Russia in winter. Even though there are not many tourists comes when its autumn season, still, Russia also a nice pretty place to spend your time there on fall. Many attraction and festival which you could experience during autumn, in addition to nice and beautiful historical architecture, become one of the reasons people go to Russia during the autumn season. Sometimes the climate in autumn could be unpredictable, it could go from cold like during the winter season to hot. While it’s not as hot as the summer season, the unpredictable weather could turn you off. But no worries, as long as you are prepared, then, there is nothing could obstruct you from enjoying the best autumn leaves viewing. Although you already know, the most attractive things during the autumn season will be in Moscow and St. Petersburg. Although I said that, most of the city is in a festive mood during the autumn season. So it’s not a wrong choice to go and see Kazan. Don’t forget to buy some souvenirs in Moscow or St Petersburg while you at it, especially for your kids or neighbors. Early of September is the best time to see some fallen leaves, although it is still hot. Another reason to visit Russia during this time is that the temperature in this period of the month has a good temperature. Also because it’s early in Early September which is the start of the autumn season. You could still see fallen autumn leaves and the animals as the background. For example, there are many brown bears which after a summer season could be seen, laying in the forest, it sometimes could be seen snoozing if you are lucky during the autumn season before it goes to hibernation. Sheep and reindeer still continue to come out and eat before winter cover the land with snow again, you could also see migratory birds prepare to leave Russia. Also there still a festival to enjoy with your autumn leaves viewing in which it’s held on 1 September called Day of Knowledge, also on 12 September, there is Muharram which is Muslim new year. so if you are a Muslim and want to try spending your new year in Russia viewing fallen autumn leaves and many of its nature. Then this is the best time for you to go. Well, the temperature is getting colder. It could go into negative -6 sometimes, but most of the time. It still has a hot degree of temperature. In Mid September you could still go to Volga River, Lake Baikal, and doing many wildlife vacations. And also the seasonal ingredient start coming to harvest, so many restaurants will have that seasonal cuisine. The duration of autumn leaves in Russia is short and it depends on the weather. As a fact, when the weather is too cold, then the leaves on the tree will fall at a faster rate. During Mid September, you could still the leaves in the tree as well as seeing the leaves fallen to the ground. 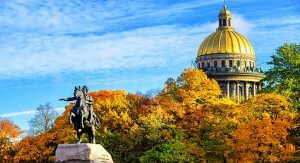 It is the best time for me in this article on the best time to visit Russia to see fallen autumn leaves. as it still provides you with fallen leaves as well as the still leaves on the tree. Also during this period of time, there is a decrease in tourists, so yeah. What’s more enjoyable than viewing fallen autumn leaves in quiet places. Also, this is the time most enjoyable as you can still go outside many times because it’s not too cold, or too hot. In late September might be the best time to enjoy fallen leaves with many trees still have many leaves on it. because you might not see it in October, because of the weather. 3. Early October to Mid October. During this time, the leaves on the tree are falling at a faster rate, and this might be your last chance to see fallen autumn leaves in Russia. I recommend you go to Moscow and even better, St Petersburg. Izmailovsky Park, Botanical Garden and Pavlovsk Park is a destination you at least need to go once, especially Pavlovsk Park. Well, St Petersburg is not a golden autumn season without a reason. Just by going to at least one of them could make you have the same opinion as me. especially the park i have said above, which is Pavlovsk Park, the garden landscape will captivate your view and the fallen autumn? Well, you should just see and watch it for yourself. If say to much in this article, it will decrease some enjoyment to find the most scenic view in your life. In late October, which is the last period during the Autumn season. The temperature becomes cold, and what more unfortunate, the leaves on the tree is already fallen. so nothing to view anymore. Still, if you enjoy walking the road and see the fallen leaves had fallen to the ground, then it is an enjoyment on its own. Yet, the best viewing experience you could not see the fallen leaves fall from the tree is sad. so you better take another time. Better yet, now talk to your boss and said you want to take one full month vacation, then you could enjoy the autumn season in Russia to the fullest. Now that is the best time to visit Russia to see fallen autumn leaves in which this article suggest. What time you choose, all depend on what you want to experience, but please. Also consider your health before choosing, because it is a season before winter. There might be a situation in which the weather is too cold for you. So look at yourself and take care of it. As long as you search the article on this site, I think you will have a fun time in Russia. Take care!! !